The forest industry turnaround has started in one of B.C.’s most forest industry dependent-communities —Mackenzie—and in a very welcome move, people are being recalled back to work at the sawmill. The recent installation of a completely computer-based grading machine in the planer mill at the Tolko High Level sawmill in Alberta shows that computerized grading systems can indeed make the grade. Faced with the shutdown of the local sawmill, B.C. logger Ralph Stewart is blazing a new business trail these days, using B.C. government timber sales to keep his harvesting equipment busy. Scott McLeod of Fleetman Consulting on how to save money through better management of fork lift equipment. Thanks to regular equipment improvements and steady family hands running the company, Quebec’s Clermond Hamel sawmill has been able to survive the industry shakeout of the last few years, and is even expanding the business. Tolko’s Meadow Lake, Saskatchewan OSB operation is going beyond turning out commodity product, with the installation of new technology to create a more versatile forming line that is capable of producing other engineered wood products. It may go back to days gone by, but forest company Conifex finds that moving logs by water is still a very efficient way to move timber, despite having to deal with the weather on Williston Lake in the B.C. Interior. After years of forest industry frustration in northwestern B.C., the First Nations-owned Gitxsan Forest Enterprises Inc has taken matters into its own hands, and is actively managing, and harvesting, a forest licence the company purchased several years ago. Included in The Edge, Canada’s leading publication on research in the forest industry—now incorporated into Logging and Sawmilling Journal—are stories on Canadian Wood Fibre Centre /Natural Resources Canada, Alberta Innovates - Bio Solutions and FPInnovations research projects. The B.C. government is trying to streamline the huge variety of different rules, regulations and operational procedures and in the process overhaul how the province’s resource roads can be more safely regulated. 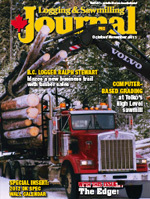 Logging and Sawmilling Journal has the latest information on what’s new in lumber grade optimization equipment. Tony Kryzanowski asks …Where is the wood lobby for Edmonton’s massive redevelopment plan? Sharp top chains are an essential component in the primary and secondary breakdown of a sawmill operation. Companies need premium performance to resist high wear and shock loads. Tsubaki offers a solution to the common problem of worn top chain tips, which typically requires chain replacement. It now offers sharp top chains with induction hardened tips. The company says its new design results in a 20 per cent increase in wear resistance without compromising strength, and this design comes standard with its products. Tsubaki also offers a wide variety of sharp top chain specifications to meet a variety of sawmill needs. Peterson’s 4800F chain flail debarker, a popular piece of equipment for removing bark for clean pulp and paper chips, has had a major redesign and includes many new features that clean chip producers demand. The new 4800F features a 350 hp Cat C9 Tier 4 engine, upper and lower flail drives (similar to Peterson’s 5000H whole tree chipper), direct drive lower infeed and outfeed rolls, floating direct drive upper feed rolls, a five-foot wide bark pusher, and Peterson’s IQAN control system. 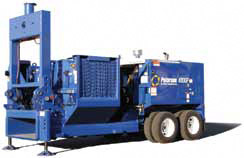 The machine also features a dedicated 100 gallon hydraulic oil tank, and a 200 gallon fuel tank to allow the 4800F to run an entire shift without fill-up. Wood-Mizer has released the new industrial-grade WM1000. It was developed both to break down up to 67” diameter logs and also to saw high value logs where the thin-kerf blade and wide cutting ensures maximum resale value. The new twin rail sawmill can be purchased with or without a log bed, and the rails can be extended to any length for cutting multiple or long logs. The ride-a-long control platform and operator console is mounted on the head, allowing the operator to closely observe and control the cutting process. The WM1000 comes standard with Wood-Mizer’s setworks system, which enables the operator to preset the required board thickness. Variable forward and reverse speeds allow the operator to adjust cutting speed to suit the size and species being cut. The WM1000 uses 2” to 3” wide thin-kerf blades to reduce waste and maximize recovery. Hydraulic blade tensioning ensures accurate cutting with a smooth finish, whether the user is halving, quartering, or producing slabs for further processing.